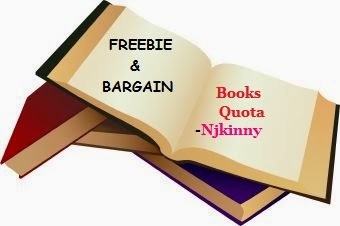 FREEBIE & BARGAIN books quota is a Monday and Thursday feature which will feature FREE and BARGAIN eBooks/Paperbacks that I read recently or want to read and which is/are available at a BARGAIN or FREE currently. Eden Christiansen never imagined her role as her younger brother Owen’s cheerleader would keep her on the sidelines of her own life. Sure, it feels good to be needed, but looking after the reckless NHL rookie leaves little time for Eden to focus on her own career. She dreamed of making a name for herself as a reporter, but is stuck writing obits—and starting to fear she doesn’t have the chops to land a major story. If only someone would step up to mentor Owen . . . but she knows better than to expect help from team veteran and bad-boy enforcer Jace Jacobsen. Jace has built his career on the infamous reputation of his aggressive behavior—on and off the ice. Now at a crossroads about his future in hockey, that reputation has him trapped. And the guilt-trip he’s getting from Eden Christiansen isn’t making things any easier. But when Owen’s carelessness leads to a career-threatening injury and Eden stumbles upon a story that could be her big break, she and Jace are thrown together . . . and begin to wonder if they belong on the same team after all. In a time when justice is hard to come by, three unconventional sisters become one notorious bandit - The Blood Blade - robbing from the corrupt lawmen to give back to the innocent. Under the persona of the bandit, Blood Blade, Cilla Richardson robs from the corrupt and gives to the poor. But an accidental kidnapping leaves her with a very handsome captive named Leo Forrester... and an idea to save her town. Determined to make a fresh start with her daughter, widow Brynne Richardson gives up her bandit activities and leaves California for Boston. Working for a handsome doctor fulfills her need to be useful and independent, but he creates another yearning she can't deny. But will he understand when she has to resurrect the Blood Blade? Lucy Richardson's bandit sisters may have taught her to sling a gun and pick a stubborn lock, but nothing prepared her for the agony of her first heartbreak. Her sisters taught her to fight like hell for what she wants... and she wants Finn. This box set includes the first four books in the bestselling Brides of Beckham Series by Kirsten Osbourne. 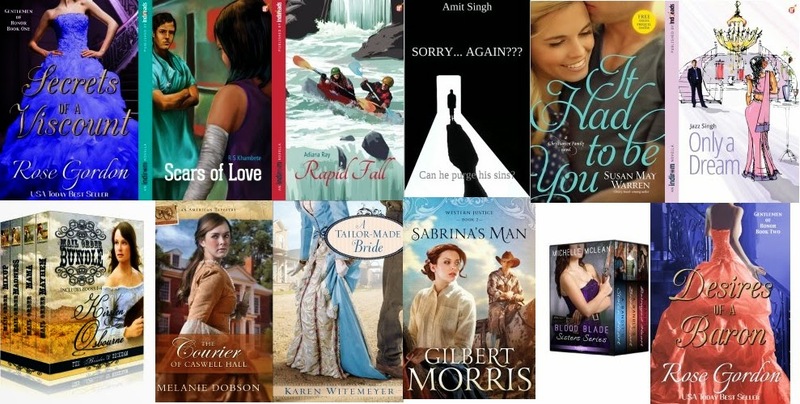 Included are: Mail Order Mayhem, Mail Order Mama, Mail Order Madness and Mail Order Mix-up. Harriett Long, a widow in Beckham, Massachusetts, begins her journey as a matchmaker by matching up four brides with grooms in the West. Follow her and her butler, Higgins, as they give desperate women their happily ever afters. Join Sabrina and Waco on a Wild West ride through Indian Territory. Sabrina’s pampered life comes to a screeching halt when a vile conman steals away her younger sister. When her daddy’s money can’t buy justice, Sabrina takes matters into her own delicate but stubborn hands and heads west to track down the outlaw. To Sabrina’s disgust, her solitary hope for saving Marianne seems to be Waco Smith, an only slightly reformed ex-criminal himself. Will these two unlikely allies bond over more than just a shared mission of rescue and revenge? An unlikely spy discovers freedom and love in the midst of the American Revolution. As the British and Continental armies wage war in 1781, the daughter of a wealthy Virginia plantation owner feels conflict raging in her own heart. Lydia Caswell comes from a family of staunch Loyalists, but she cares only about peace. Her friend Sarah Hammond, however, longs to join the fight. Both women’s families have already been divided by a costly war that sets father against son and neighbor against neighbor; a war that makes it impossible to guess who can be trusted. One snowy night Lydia discovers a wounded man on the riverbank near Caswell Hall, and her decision to save him will change her life. Nathan introduces her to a secret network of spies, couriers, disguises, and coded messages—a network that may be the Patriots’ only hope for winning the war. When British officers take over Caswell Hall and wreak havoc on neighboring plantations, Lydia will have to choose between loyalty and freedom; between her family’s protection and her own heart’s desires. As both armies gather near Williamsburg for a pivotal battle, both Lydia and Sarah must decide how high a price they are willing to pay to help the men they love. more devoted to fashion than true beauty. Yet, except for her well-tailored clothing, this seamstress is not at all what he expected. manner while at the same time stirring her heart with unexpected acts of kindness. Which side of Jericho Tucker reflects the real man? When Hannah decides to help Jericho's sister catch a beau--leading to uproarious consequences for the whole town--will Jericho and Hannah find a way to bridge the gap between them? Sid is the inevitable effect of what a small town upbringing brings to the city life. A self-confessed “unromantic”, somewhere in his simple exterior lies a weak preacher, whose yardsticks of life change radically when the unpredictability of life starts experimenting with him. Anushka, armed with her unselfconscious beauty and poisons imbued into her life, has declared war on the world of men from a young age. Their romance, even after her protest, is ignited by a train robbery that becomes unforgettable for reasons other than the robbery, catches the warmth because of an adolescent romance that reaches consummation, but remains within the periphery because of a live-in relationship that is on the verge of break-up. They fall in love, but somebody is not happy with their relationship. Sid is threatened. Will he rise above his fear this time? Isabelle Knight has just been given an unexpected fortune and is in the midst of doing what she never believed she'd have to do: spend a Season on the Marriage Mart. Finding no one who seems to catch her fancy--or even seems bearable to tolerate until death do them part--her entire world is sent spinning with the sudden appearance of none other than her former husband. Isabelle is in no position to refuse his offer to help her find a husband and reluctantly agrees, but what neither counts on is her future husband just might be the one she’s still secretly married to. Rhea is successful, accomplished and perfectly content in the comfortable little niche she has carved out for herself. She’s moved on from the heartbreak of her past, and hasn’t looked back in years. When Varun comes waltzing into her life again, however, Rhea is unprepared for the rush of memories that upset her neat little life. Nor is she able to push back her broken dreams, and learn to trust again. A freak accident turns Seema’s perfect life upside down. Horribly burnt and in pain, her hospital bills are mounting, her job is at stake and her handsome fiancé seems more and more distant. If it wasn’t for the annoyingly determined doctor, Seema would have given up long ago. After all, what was there left to live for? What will it take for Seema to accept her own scarred body, and fight to reclaim all that she has lost? Lucy Whitaker is a fallen woman who has done her best to build a life for her and her son. But when her son finds a battered gentleman left on the side of the road, her entire world is about to come crashing down as she once again finds herself caught between two brothers: an heir and a spare. Will Lucy's dislike for nobility forever keep her from eternal happiness or can Giles convince her to follow her heart and take a chance on loving a baron? Sonia and JD’s tempestuous attraction is as stormy as the rapids at Rishikesh. Not even a dip in icy waters can douse the sparks that fly when they are around each other. JD’s recent divorce, however, has left him commitment phobic and bitter, and he doesn’t seem to want more than a physical relationship. At heart, Sonia is conservative; can she bring herself to accept a modern ‘live-in’ relationship, or will she push him away with her demands for a commitment?